I'm back with another review of a liquid lipstick. My Lime Crime post drives traffic twice as my blog usually has when it went live so I guess I'll be doing more beauty related posts in the future. Updated Sept 21st 2016 : I added Charming shade! 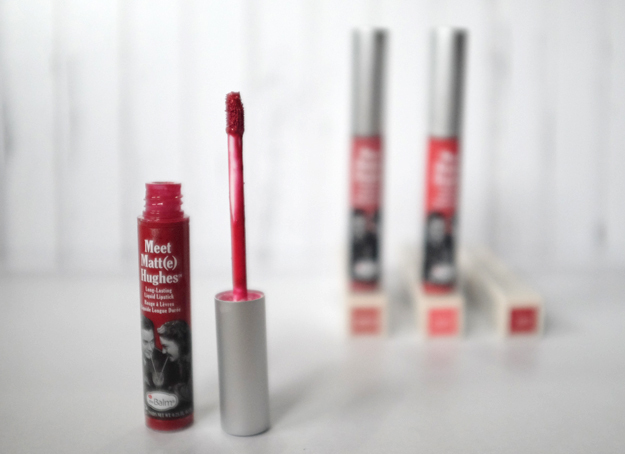 The applicator is pretty much like every other liquid lipstick out there. Upon applying, you'll notice a strong mint and a faint vanilla scent. I don't like mint by the way but the cool feeling as the lipstick dry was actually cool (pun intended). If you're like me and you're not a fan of mint, well, tough luck. Because this is a really good product. It's cheaper than Lime Crime's but the quality is similar. I had a greasy meal and only the inside lip needs touch up. The rest of the color stay put and it does not feather. I didn't even use any lip liner. It's not too drying either (because let's be real, anything matte is slightly drying) unlike my L.A. Girl or ColourPop. I did feel it gets drier the longer you wear it.. I'm not sure if it's just me (my lips are not dry) or I just didn't drink enough water that day (I was wearing Honest from 11AM to 8PM). 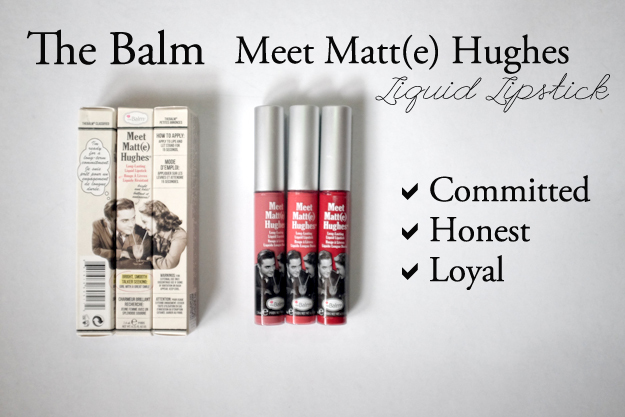 I purchased my Lime Crime around 350-400k rupiah while this Meet Matte(e) Hughes is only around 200-250k rupiah. So you can actually bought two colors of The Balm's for one Lime Crime. I first bought Committed, liked it, and I went back to purchase Honest and Loyal. Yes, I don't like the mint scent, but I just bear with it, because I like this product a lot. Its creamy formula makes sure a smooth coverage just in one swipe but for full coverage of your lip color, I actually like to use two layers. In my opinion, you don't need a lip liner for Committed and Honest but Loyal definitely a must in terms of lip lining. I used MAC Kiss Me Quick for Loyal. All three have matte finish and dries fast however for Loyal, it's never completely dry.. It has some sort of sticky feel when you put your lips together but nothing too crazy. And that is also why Loyal is the less drying of all three and the least kiss-proof. For Committed and Honest, it's not transferable but when I kiss-proof tested it, I did get a little color on my hands so I wouldn't say it's completely kiss-proof. Drinking in a glass seems to have zero transfer when you didn't put pressure to your cup. I'm not sure why all of my Honest' photos are so yellow! I adjusted the Color Balance ever so slightly just so it looks closer to real life color. My favorite is definitely Honest because it's just soooo pretty. It' brightens my whole face with its pretty coral color. These photos do no justice. Committed looks a little washed out on me, but it's a great neutral lip color for days when you feel like you want to do bold eyes. And Loyal is also an awesome color but I still like my OFRA Atlantic City better just because that one is slightly deeper which kind of gives this demure vibe and Loyal is more bright which is not bad but it's more "badass" kind of vibe and if you know me in real life, I am not a badass at all. I'm one of those annoying goody-two-shoes type of girl. Well, I hope everybody will have a great week ahead! 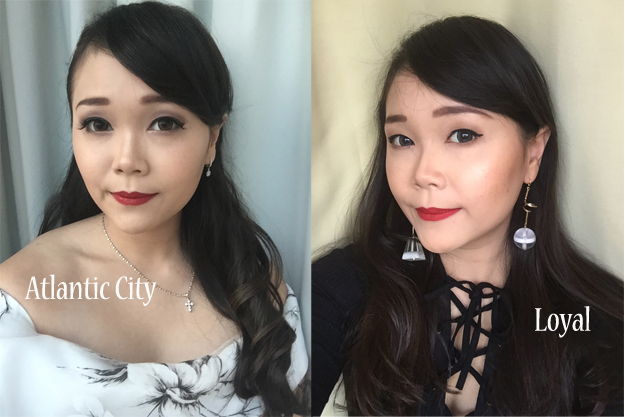 I received Charming shade as a birthday present and since this post seems to be on my top 5 most read posts week after week, I decided to add the photos. This particular shade is like the badder sister of Committed. It's a deep pink colour with a hint of purple which I think compliments so many of fall outfit colours!